New York’s Bensonhurst Statue House is a cacophonous pop culture tableau. And you thought gnomes were bad. It’s hard to miss what has come to be known simply as the Bensonhurst Statue House on 85th Street in Brooklyn, since dozens of superheroes, vampires, wizards, and more are standing sentinel in the middle of an otherwise unremarkable neighborhood. While it might seem like a lawn art oddity to many, former marine Steve Campanella simply calls it “home.” And he has made damn well sure that people know that it is his home by outfitting the public-facing facade with dozens of pop culture statues. As of 2008, there were at least 32 of the life-size figures propped up against the walls of the home and garage, and despite each one costing hundreds of dollars, the collection has likely continued to grow. Almost all of the figures in the collection are of pop culture characters. The Blues Brothers can be seen sitting on a bench by the garage, while Superman bursts out of the wall above the front door. Another Superman figure, Clark Kent in midtransformation, stands in a reclaimed phone booth nearby. Dracula and Frankenstein stand next to an indian and a pirate above the garage door. 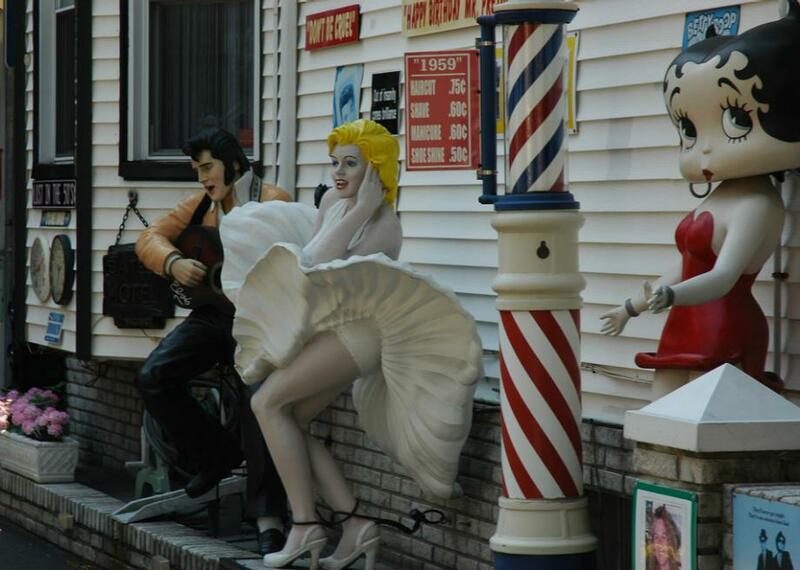 * Elvis, Marilyn Monroe, and Betty Boop look on. The figures go on and on. In any of the spots that aren’t inhabited by a fiberglass figure, vintage signs have been posted up ranging from road signs to instructions for good Brooklyn etiquette. Campanella is an inveterate collector, and his garage is also full of artifacts and finds that he has been known to show off to curious visitors. Since this is a private residence, privacy should be respected, but feel free to drop by and take a look at one of the last lingering examples of old New York idiosyncrasy. *Correction, Sept. 19, 2016: This post originally misspelled the name Frankenstein.